Nanotechnologists from Rice University and China's Tianjin University have used 3-D laser printing to fabricate centimeter-sized objects of atomically thin graphene. "This study is a first of its kind," said Rice chemist James Tour, co-corresponding author of the paper. 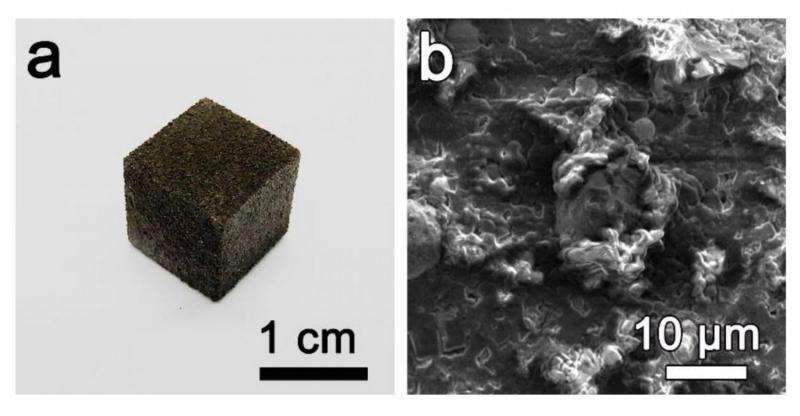 "We have shown how to make 3-D graphene foams from nongraphene starting materials, and the method lends itself to being scaled to graphene foams for additive manufacturing applications with pore-size control." For example, researchers in Tour's lab began using lasers, powdered sugar and nickel to make 3-D graphene foam in late 2016. Earlier this year they showed that they could reinforce the foam with carbon nanotubes, which produced a material they dubbed "rebar graphene" that could retain its shape while supporting 3,000 times its own weight. But making rebar graphene was no simple task. It required a pre-fabricated 3-D mold, a 1,000-degree Celsius chemical vapor deposition (CVD) process and nearly three hours of heating and cooling. In the latest study, a team from Tour's lab and the labs of Rice's Jun Luo and Tianjin's Naiqin Zhao adapted a common 3-D printing technique to make fingertip-size blocks of graphene foam. The process is conducted at room temperature. No molds are required and the starting materials are powdered sugar and nickel powder. "This simple and efficient method does away with the need for both cold-press molds and high-temperature CVD treatment," said co-lead author Junwei Sha, a former student in Tour's lab who is now a postdoctoral researcher at Tianjin. "We should also be able to use this process to produce specific types of graphene foam like 3-D printed rebar graphene as well as both nitrogen- and sulfur-doped graphene foam by changing the precursor powders." "The 3-D graphene foams prepared by our method show promise for applications that require rapid prototyping and manufacturing of 3-D carbon materials, including energy storage, damping and sound absorption," said co-lead author Yilun Li, a graduate student at Rice.